Wyclef Jean is helping his earthquake-stricken homeland of Haiti the best way he knows how — by running for president. Wyclef Jean started Thursday, August 5, as an international singing sensation, but ended the day in the spotlight as a hopeful political leader for the impoverished land of Haiti. Jean, who rose to fame as a member of the musical group, the Fugees, announced his formal bid to run for presidency in front of a massive crowd in Haiti’s capital of Port-au-Prince. 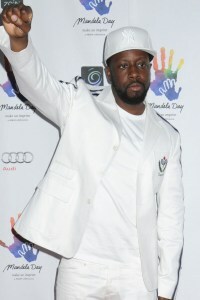 During the thunderous applause and excitement, Wyclef Jean took to the supporters and body surfed through the crowd. The newly appointed politician ended up on a speaker truck and addressed his onlookers. “America has Barack Obama and Haiti has Wyclef Jean,” the proud Haitian artist roared to the crowd of hundreds. Jean, who was born in Haiti but raised in New York, was fully aware of the historical importance in filing candidacy papers. “It’s a moment in time and in history. It’s very emotional,” Jean expressed to the Associated Press. Wyclef Jean’s run for President of Haiti isn’t a lock, however. An eight-member board will review the candidates and verify their candidacy requirements. One major hiccup that could affect Jean’s chance to take over Haiti is the fact that he grew up in the United States. Jean feels confident his roving ambassador status will clear him of any Haiti residency requirements. Should Wyclef Jean pass all the necessary measures to run for office and actually be elected President of Haiti, the job will not be easy. Wyclef Jean would inherit a devastated Port-au-Prince, an estimated 1.6 million homeless epidemic, and financial quarrels over international reconstruction funds stemming from the 2010 earthquake that killed an estimated 300,000 citizens. Musicians turning to politics might be a theme for the November 28 elections. Wyclef Jean’s friend and fellow musician, Michel “Sweet Micky” Martelly, also submitted his candidacy papers. “I hope politics will not divide us,” Martelly stated. Stay tuned as SheKnows brings you the most up to date information on Wyclef Jean’s run for President of Haiti.